Desktop calendar featuring 12 all-new original illustrations. The 2018-2019 Touken Ranbu Desktop Calendar is here! A collection of 12 all-new original illustrations from the Touken Ranbu character designers. 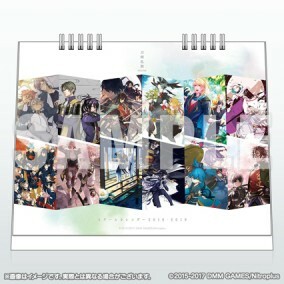 Designed so that the calendar and illustration portions are separated left and right, so you can display your favorite Touken Danshi regardless of what month it is. ・Covers April 2018 - March 2019 Japanese school year. ・This is one of the items in the "Touken Ranbu Winter 2017 Comiket Set." The event bonus "Touken Ranbu Mini-Stickers" is not included. ・There are no plans to release the "Touken Ranbu Winter 2017 Comiket Set." First available as part of the Comic Market 93 Touken Ranbu Winter 2017 Comiket Set.